In case the news hasn’t made it to your Inbox, DraftSight for MAC is now available for download at DraftSight.com. Since I don’t own a MAC…I’ll just have to listen to the feedback from folks that do. The LINUX version is still on schedule to be available towards the end of the year. Now this PURE speculation….but I can’t help but wonder…. Could it be possible that we might see this application ported to the iPad as well? What would you think about that? BTW: My wife bought an iPad for her upcoming Book Tour….so I hijacked it for a little bit tonight to see how easily I could post with it. Works pretty well! Of course…the wireless keyboard certainly helps. That’s great news! I have and always will be a Mac user. This should be a very cool app to finally put on my laptop and iMac at home. I don’t have an iPad yet, but it seems like it would be great for that too. This is a great article, and good news too!..We’re devoted MAC users and this application looks very interesting. Keep up the great work! Wow, everyone seems pretty excited about this. I will have to check it out in further detail, thanks! Well, from the pics it looks pretty advanced! As a long time Mac user I wince every time someone uses “MAC” instead of “Mac”. MAC is an acronym for something completely different! Linux is also spelled normally. I don’t mean to crab and I don’t think I’m a Mac snob, but the little details are important. Draftsight has finally made a debut at the MAC, thanks for sharing it with us, I would love to see it in future with some more new innovations. LOL! I’m not a Mac guy…but…. I have noted this for any future “Mac” related posts. Something new and something fishy, I would like to have a little more detail and about its authenticity, as anything can happen in this modern world nowadays. Thanks for making this available to us Mac folks! Hmmm, is it available for the ipad yet I wonder? That would be pretty dang sweet! Nice now its going be easier to work on Mac Thanks for thr info! yes this blog very informatife.. Very advance, lesson you got there , thanks a lot. this will really help me. That is right. We need to know about “MAC” or “Mac”. Mac is a good product. i like it very much. it is wonderful. thanks very much for it. Works nice, but doesn’t work like the windows version. It’s very difficult to configure the user prefs. The toolbars, menu’s and side bars can’t be turned on and locked. 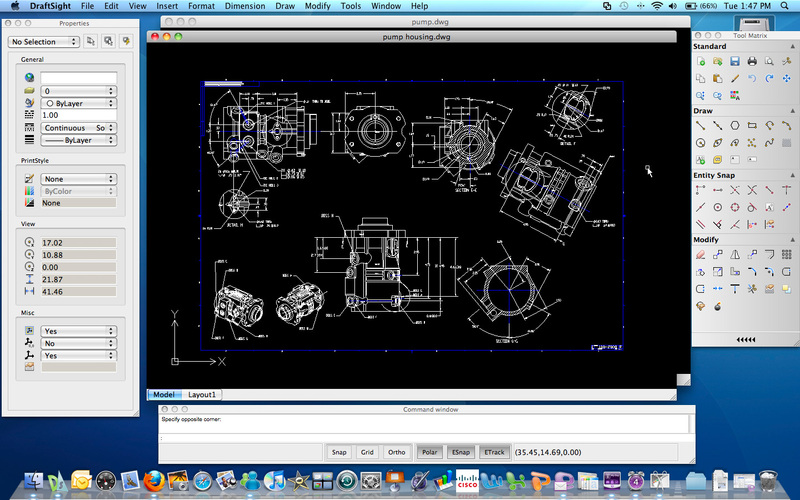 DraftSight has been widely accepted by the CAD and engineering community since its launch in June 2010. A lot of hard work has gone into this product, including many improvements in the beta.